We find here in this first number some poems and an article on aesthetics, "Du Sujet dans la Peinture moderne," written by Guillaume Apollinaire, as well as many other texts on literary criticism. 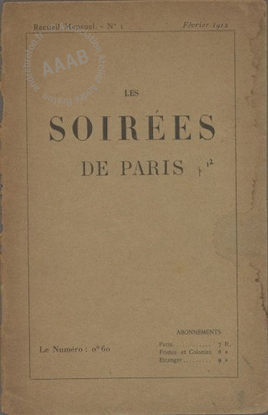 Texts by Apollinaire, Jarry, Cendrars etc. and reproductions of works of art by Picabia, Archipenko, le Douanier Rousseau, etc. N° 1 de février 1912, n°18, n°19, n°20 de 1913, n° 21, 22, 23, 24, 35, 26/27 de 1914. Paris, février 1912. In-4° broché.